One million Euros was invested in the catering facilities and the project took about 18 months to complete. There are temperature controlled separate food preparation areas in the basement where the prepared food is sent on trolleys via a food lift to the kitchen upstairs for cooking, portioning, plating and serving. The Cook-Chill system is utilised for the 500 banqueting covers. Several bars were designed along with an 80 cover oriental kitchen with a water wash canopy to dispel the grease from the wok cooking. Dishwashing is carried out in the basement with the dirties going down in one lift and cleans coming up in a separate lift. 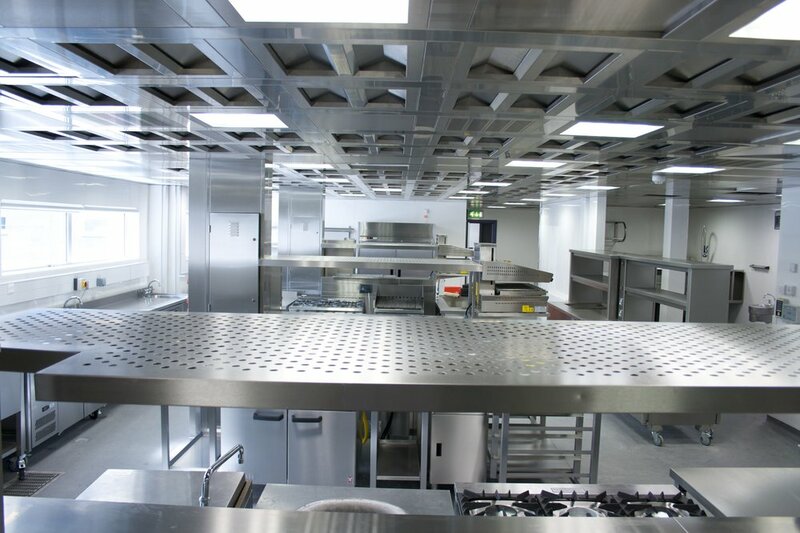 The area is kept safe and dry with the inclusion of a ADO-Metal UK stainless steel floor channel and roll grids which are easily uplifted, rolled and sanitised in a dishwasher. Due to the high demand for ice throughout the building a dedicated ice room was installed with strict hygiene regulations in place because ice is treated as food. A central Cook & Freeze operation for 3,000 meals per day with 14 days’ storage capacity for 42,000 meals required meticulous planning, especially since all the fresh ingredients are stored and prepared on site under the strictest hygiene controls. A total of 25 individual areas were designed including hygiene stations, dolly wash and waste bin compound. A major refurbishment of the building necessitated the expansion of the staff restaurant on the top floor which was serving 200 daily meals. Since it’s transformation the turnover has increased by 50%. This is due to the provision of an open plan kitchen and theatre style servery where the customers become wholly involved with the dining experience, a large self help salad bar, separate Deli counter serving bespoke sandwiches and barista coffee, which remains open throughout the day and provides an informal meeting area with a beverage station dispensing hot and cold drinks. Noisy operations such dishwashing, deliveries, food preparation, waste collation and hospitality trolley make-up are out of sight of the servery and customers’ view. 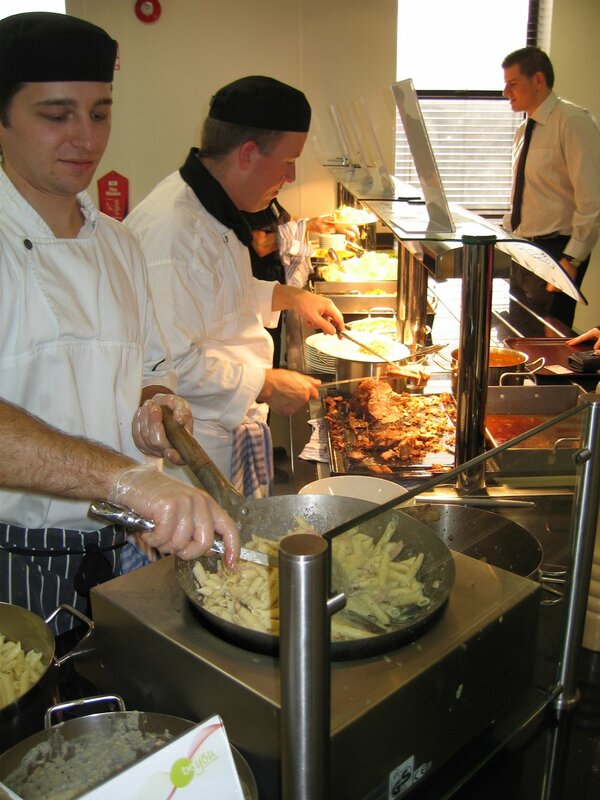 A world-wide Swiss manufacturer of measuring equipment rebuilt their UK operation in 2008 and required a staff restaurant for 200 employees with the capacity to cater for functions. The ventilated ceiling reflects the layout of the dining room ceiling and creates the impression of spaciousness and also includes the discreet fire suppression system. All catering operations, apart from dishwashing, are on view to the customer including the induction wok cooking on the servery counter. This French-based company relocated the staff facilities to a new building within their grounds and required 2 shifts of 200 people to be served with three meals a day, excluding the vending. The open plan servery incorporates the cooking and food preparation, with bulk preparation, dishwashing and refrigerated and dry goods storage out of sight of the customer. The ventilated ceiling, following the contour of the main counters, creates the illusion of space in what would otherwise be a small area if canopies had been provided. The inclusion of a non intrusive fire suppression system supports this impression. Other facilities include the central salad and soup counter, chilled multi decks and a beverage counter supplying draught soft drinks. The brief was to include a dining-in and takeaway service from the Refectory, known as The Hub, for 1,000 students, corporate hospitality for 400 with several functions taking place at the same time, a Coffee & Deli servery, and a separate dining facility on the lower floor for 300 summer language students or private use within the existing refurbished building. This was achieved by the main kitchen undertaking the preparation and bulk cooking with the majority of theatre cooking being front of house on a central island with induction woks, pasta cookers and waffle irons. The main servery provides a call order grill bar, rotisserie, pizza merchandiser (pizzas being baked on a conveyor oven in the main kitchen along with cookies to be sold in the Coffee & Deli), a traditional hot section, large separate salad bars and several chilled multi decks. The dishwashing location is indicated by a wall mounted tray return carousel within the dining room which eradicates the need for overflowing unsightly tray return trolleys. The Coffee & Deli provides cooked snacks, sandwiches and pastries with an adjoining shop area where the chilled/frozen multi decks contain takeaway food for the live-in students/conference delegates to cook and consume in their rooms. The Roman Catholic College underwent a £42m complete redevelopment on the existing site aiming to improve building facilities from the ageing structure. The £350,000 scheme was designed and specified by us and we are in no doubt that the resultant outstanding quality of the open plan kitchen, servery, separate Deli, first floor Coffee Bar and their support areas is mainly due to the installation work carried out by C & C Catering Equipment Ltd and in particular their Project Manager, Keith Hartharn with his conscientious team. The integrity of our designs was maintained throughout and the installation was completed on time to the immense satisfaction of the client. The Grade 1 Listed building required a servery to be located in one of their magnificent rooms and, through intensive consultation with the catering staff and school management, the Garter Room was chosen. The 800 coeducational boarding and day students and staff are catered for 3 times a day. The school’s renowned corporate hospitality and private function provision also had to be incorporated within the layout of the other three rooms designated for dining in. The counters are constructed using high quality natural finishes with granite tops and designed to be in harmony with their august surroundings. Several are capable of multi function use and in particular the reusable cups dispenser trolleys are stored within the body of the beverage counter. With a planned completion date of 2012 the 235 bed hospital will be a world class rehabilitation facility. Standards for catering have significantly changed and advanced over recent years, including the need to manage water pressures, air changes and waste management. Sterling was engaged to design efficient workflows within the 6 floor levels comprising 9 ward dining rooms and adjacent pantries, a coffee outlet and shop with store, a staff and visitors’ servery, the main kitchen and 23 associated support facilities with a central wash up. As part of the hospital’s forward thinking policy a Meiko food waste vacuum removal system has been incorporated into the new building which will transfer waste food from the wash ups via a vacuum stream through a pipe network to a remote waste holding tank. This will be emptied by a contractor for use as biofuel or compost after further treatment. The hospital has also invested in a wireless temperature monitoring system which is connected to the temperature sensitive catering storage equipment on all levels and will report and record any adverse change in operation such as a refrigerator door having been left open to a PC or mobile phone, something that is crucial for HACCP management. The building of a multi million pound Spa adjacent to the 18th century Palladian mansion required an equally impressive open plan Brasserie kitchen. An Elro Sirius induction range takes centre stage not only for its fine performance but to reduce the energy consumption and ventilation requirements. Low energy lighting is also used throughout to mitigate operational costs and enhance the ambience. To create the streamlined finished look all the equipment visible to the diners is on a plinth and built-in, including the Jestic wood burning stone hearth oven, used for baking speciality breads, meat and fish. We specified a LeighTec ventilated ceiling containing the Nobel fire suppression system in preference to a canopy to maintain the sleek look. Less glamorous tasks such as utensil washing, dishwashing and vegetable preparation are out of sight and do not spoil the visual impact. An adjoining bar and support area was also included in our designs. Michelin star Executive Chef, Hywel Jones, commissioned Sterling to re-organise his existing main hotel kitchen whilst we were designing the new Brasserie. The refurbishment included replacing the gas solid tops with an Elro induction range, a new hot and cold pass, coldroom, pastry and general preparation areas. 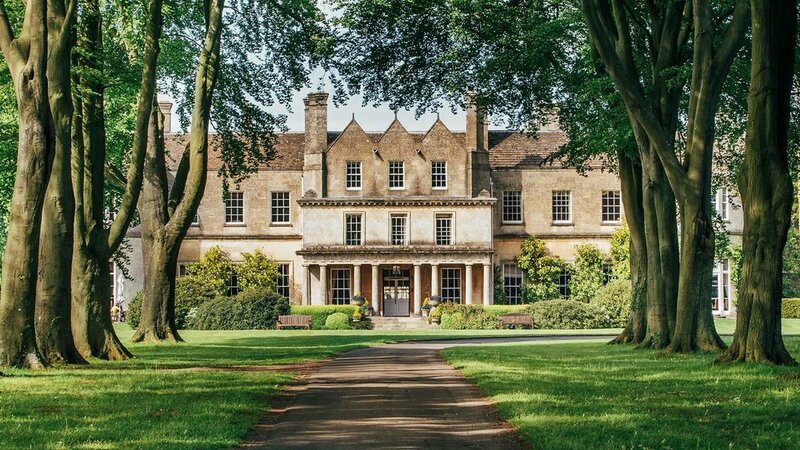 Award winning Whatley Manor Hotel, formerly a listed Cotswold manor house the transformed hotel opened in July 2003. The 23 bedrooms, including suites, Spa, 2 bars, 2 restaurants and a central kitchen exude style and class. The brief was that the guests were not to be disturbed by any sight, sound or smell of kitchen activity. This was achieved by goods inwards, all necessary storage, food preparation, utensil and dishwashing being carried out in the basement. Delivery of the clean ware and prepared food is via a designated clean lift to the upper floor kitchen whereas the soiled crockery and utensils are despatched downstairs in a separate dirties lift. The areas are kept meticulously clean by the use of wash down hose reels and the inclusion of ADO-Metal UK stainless steel floor channels and roll grids which are lifted, rolled and sanitised in the dishwasher. A hand built seven metre Bonnet Maestro cooking range serves both restaurants – The Dining Room and the Bistro – and the surrounding fabrication containing refrigerated and storage cupboards, is also manufactured by Bonnet. 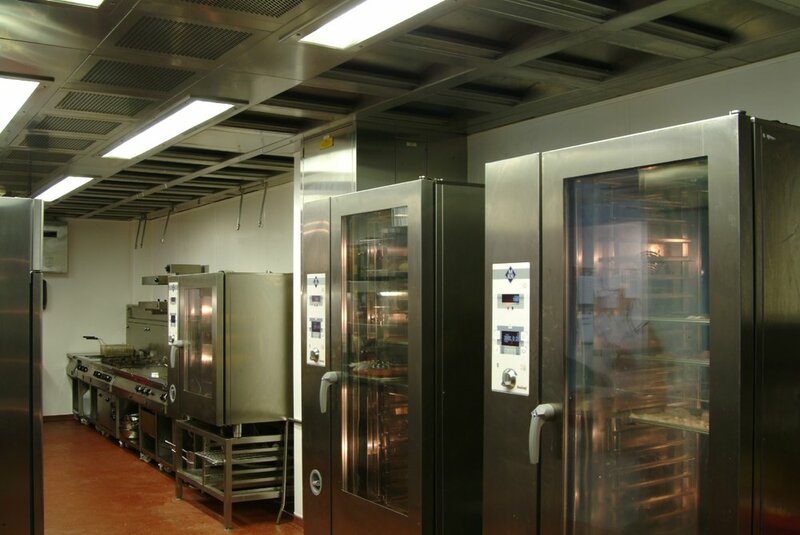 A ventilated ceiling containing an ultra violet grease and odour removal system covers the whole area and the adjacent pastry preparation area is temperature controlled. Our task was to design the five star facilities without the input of an Executive Chef but Martin Burge was appointed upon completion and has since gained a second Michelin star. The new clubhouse was built for the Ryder Cup 2006. One million Euros was invested in the catering facilities and the project took about eighteen months to complete. There are temperature controlled separate food preparation areas in the basement where the prepared food is sent on trolleys via a food lift to the kitchen upstairs for cooking, portioning, plating and serving. The Cook-Chill system is utilised for the 500 banqueting covers. Several bars were designed along with an 80 cover oriental kitchen with a water wash canopy to dispel the grease from the wok cooking. Modernising and rationalising the kitchen facilities, which dated from the 1900s, meant adhering to the strict Historic Scotland regulations and involved retaining and encasing the tiled walls and floor and other features and finishes. To obtain the correct work flow a light well was filled in to provide a new floor for the central kitchen and existing areas were integrated and enhanced. The centrepiece is a 3.2 metre long Elro induction range with its separate pressure bratt pan and 2 salamanders and a Wimbock vaulted ceiling which suits the ambience better than a conventional flat ceiling. Additional equipment includes combination ovens with water filters on slide out runners to facilitate servicing and built in refrigerated counters, all supported on plinths. The surrounding stainless steel fabrication from Stellex has a bull nose edge to match the profile of the Elro range. Other areas leading off the main kitchen include goods inwards, vegetable and pastry preparation, dishwashing and glass washing, which requires a reverse osmosis system to deal with the high peat content of the water. A dispense bar and 2 supporting pantries adjacent to the dining rooms provide the still room function and pre ordered packed lunches. Completed in 2001 this is the first purpose built track in the UK since Brooklands opened in 1907. Rockingham has a £70 million ¼ kilometre long grandstand accommodating 7,500 seats and 20,000 spectators around the circuit. It consists of the race control, press centre, commentary boxes, 56 corporate hospitality suites for 1,000 people, a 120 cover restaurant and a private club. Food is prepared and cooked in the galley style kitchens on each of the 6 levels, a total of 24 Rational combination ovens were installed, with a production kitchen and wash up on the ground floor servicing The Pit Stop, a fast food outlet. Now known as The Church this was originally built in 1627 and is notable for being the first Dublin church to be built with galleries. These played an essential part in the transformation into a bar and restaurant venue with 5 distinct settings on 4 levels including an imposing central bar, lounge, bistro and disco with a bar. Due to the space constraints the draught beer is pumped under the road from another building. 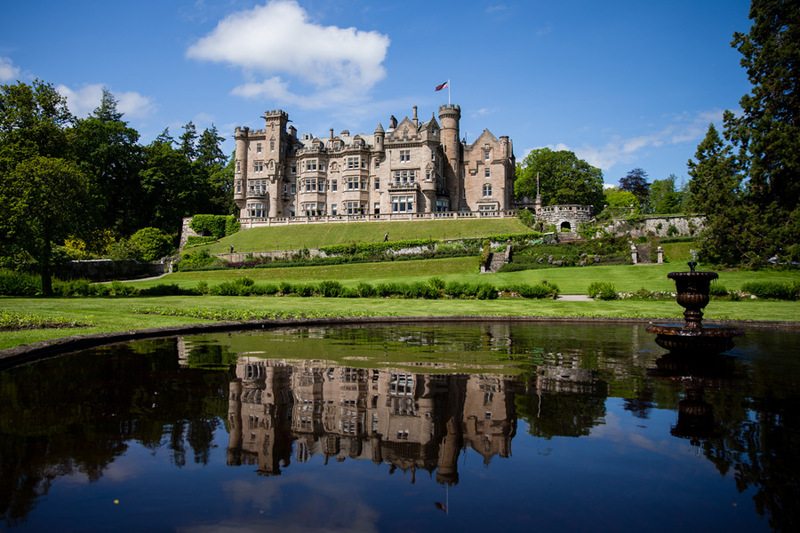 There has been a Castle on the site of Skibo since the 12th century and between 1898 and 1902 it was remodelled as a private house by the steel magnate and philanthropist, Andrew Carnegie who was then the richest man in the world. In the early 1980s the family sold the Grade A Listed building to a businessman and it eventually became the Carnegie Club, for private members only. The 21 bedroom Castle sits in 8,500 acres of country estate with 12 lodges, Spa, golf course and a clubhouse where lunches and barbeques are served. Modernising and rationalising the kitchen facilities, which dated from the 1900s, meant adhering to the strict Historic Scotland regulations and involved retaining and encasing the tiled walls and floor and other features and finishes. To obtain the correct work flow a light well was filled-in to provide a new floor for the central kitchen and existing areas were integrated and enhanced. A visitor attraction since the 18th century, Stowe House is the principal temple of the picturesque and famous Landscape Gardens, which were endowed to the National Trust in 1989. The Grade 1 Listed house, built in 1676, was saved from certain destruction by the foundation of Stowe School in 1923 and after two successful phases of an ambitious six phase restoration programme the house is gradually returning to its former magnificence. The dining facilities on the ground floor are found in the Temple Room and State Dining Room with the new serveries housed in the Garter Room. The public have access to these rooms for functions or viewing. The Clink is a charity which establishes a commercial kitchen and restaurant either within the prison or separate as with this de-consecrated 100 year old chapel at HMP Styal, whereby selected inmates are professionally trained to cook for or serve the customers with the goal of acquiring educational qualifications. This is the first female institution which is to develop a Clink facility. As a Professional Member of the Foodservice Consultants Society International Andrew Powis of Sterling Foodservice Design, in Joint Partnership with his wife Elaine, was appointed to design their fine dine catering facilities and non alcoholic bar at this new site. They regarded it as being a great honour as well as a huge challenge for all those involved in the project. The chapel is a stunning background but required a large amount of planning to ensure the open plan kitchen and associated services within a limited floor space, including a mezzanine floor with staff facilities, could be accommodated without harming the historic decorative features and mindful of all current legislation. The open plan kitchen is a signature feature of The Clink’s concept which Sterling further developed into a state of the art facility, utilising their extensive knowledge and experience. All equipment needed to reflect a modern traditional kitchen operation from goods inward, storage, preparation, cooking and dishwashing so that the inmates would be fully prepared for when they gain employment. 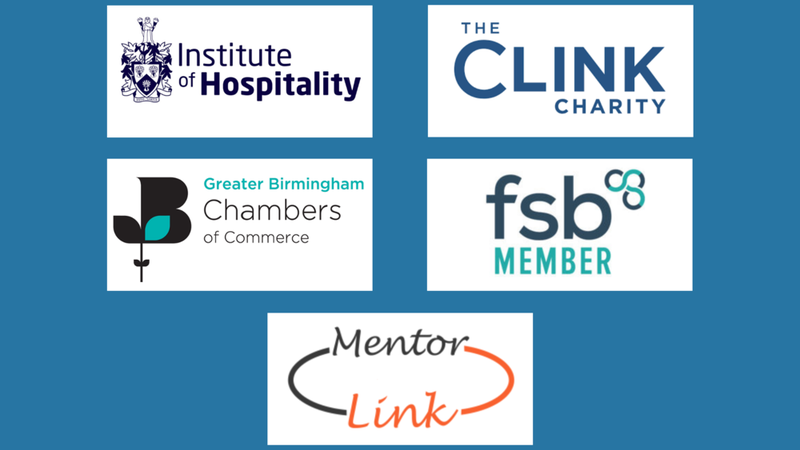 Several suppliers have already generously supported the previous Clink projects but Andrew and Elaine approached many who were unaware of the charity’s work and were more than willing to provide their equipment at cost or free of charge. The total equipment kindly provided was in excess of £100,000.00. All contributions will be recognised by being named on a “thank you” board in the restaurant’s entrance lobby as well as on their website. Sterling specified a Leigh Tec Systems ventilated ceiling in order to provide an unobstructed view across the heated granite/ambient pass to the focal point of the Nayati one piece top cooking suite which incorporates an oven, pasta cookers, fryers, induction tops and gas hobs. This ceiling accommodates a Fireworks fire suppression system which utilizes small unobtrusive nozzles in keeping with the concept. One of the most important elements was the installation of the drainage channels and roll-grids made by Ado-Metal which are anti skid, anti splash and can be rolled up to be put in the dishwasher for sanitisation. 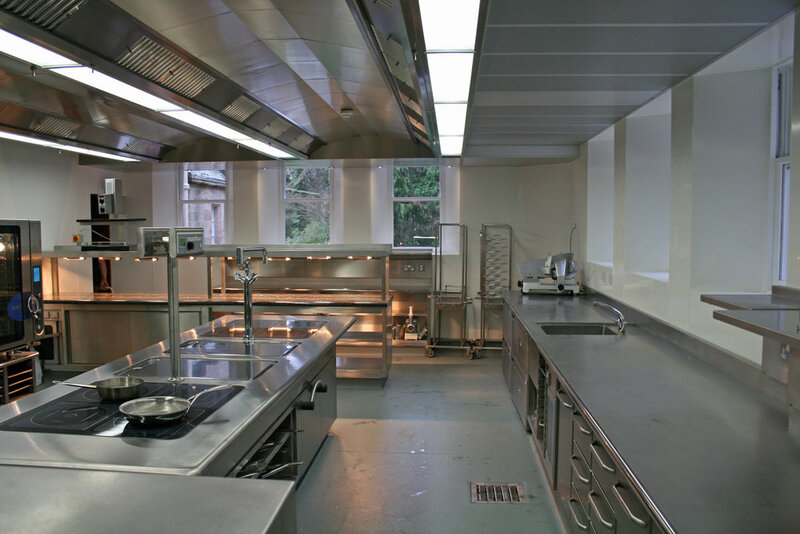 C & C Catering Equipment Limited were tasked with the supply of the fabricated stainless steel tables, sinks and pass counter to Sterling’s specification and also co-ordinating the majority of equipment deliveries and installation. All the administration of the project was undertaken by Elaine to enable The Clink to place orders directly with the suppliers and she organised the training programme involving the suppliers in conjunction with the General Manager of Training & Openings which resulted in certificates being issued to the trainees. Supervising the installation meant attendance at a number of site meetings with the whole employer and contractor teams during the initial enabling works and throughout the fit out period to completion. This was to ensure that The Clink received the expected standard of installation which Sterling had set. Located in a regenerated area on the outskirts of Glasgow the new £14 million Campus needed to provide kitchen, restaurant and bar training facilities for 16 full time students and encompass an energy efficient approach. Each student is equipped with their own workstation incorporating a bench, sink, refrigerator and have access to UV knife sterilisers. The central cooking plinth comprises Baron four burner gas ranges, griddles, their work benches and the illusion is of a one piece top but in fact every component has been seamlessly joined together and mounted on a plinth. Rise and fall salamanders are supported from the services distribution unit with a Rational combination oven and bake off oven completing the equipment requirements. The ventilated ceiling, incorporating lighting, emergency lighting and extract and replacement air enhances the openness of the area and allows clear sight and communication between the occupants which could otherwise be hampered by an intrusive canopy. The £64 million Campus provides an exceptional working environment and our involvement was to design a training kitchen including a bakery facility, production kitchen with ethnic cooking equipment, restaurant with bar, refectory, shop, staff tea points, hairdressing laundry, creche catering facilities and all ancillary support areas. As with all our projects the necessity for compliance with the Disability and Discrimination Act 2004 was paramount. The Campus is one of the first buildings in the UK to achieve a BREEAM (the Environmental Assessment Method For Buildings Around The World) kitemark. We worked with the award winning Tralee Institute of Technology, in designing and equipping a series of inter linked training kitchens for the new building, a key objective was to reflect the diversity of today’s foodservice industry in a safe, practical, student friendly training environment. The brief was to equip a single building with 3 x 18 student training kitchens, a bakery, 2 production kitchens, a demonstration kitchen, a central wash up for both crockery and glassware plus a 70 cover multi function restaurant and bar. The kitchens have to encompass everything from classic five star dining to bulk meal production, including speciality menu styles using woks, tandoor ovens and the latest baking and combination oven technology. Our innovative mobile student stations consist of gastronorm size sinks with inset cutting boards to enable them to extend the workout area, undercounter 3 drawer refrigerators to train them on food segregation and either a mobile electric or gas range. All equipment is on quick disconnect hoses to allow for thorough cleaning or for the equipment to be interchangeable. For these ground breaking facilities we were honoured with an FCSI “Excellence in Design” award.